William "Billy Mac" McIntyre never saw much of his father growing up. His mother explained his father's long absences by claiming that Jimmy McIntyre had joined the merchant marines. Billy Mac knew better though. He'd found his father's costume. He knew his father was the hired underling of a costumed criminal. But Billy Mac kept quiet because he didn't want to hurt his mother. 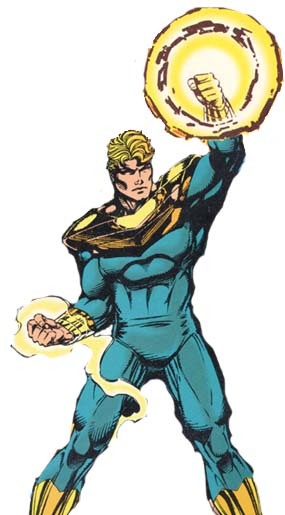 Jimmy McIntyre worked for an old enemy of the original Hourman's named Dr. Cobalt. At one point, however, Jimmy had actually lept out to save Hourman from one of Dr. Cobalt's blasts. Hourman then, in turn, apprehended Dr. Cobalt and his gang. Jimmy MacIntyre was sentenced to hard time. Feeling like he owed Jimmy something, Hourman payed a late night visit to the MacIntyre home where he confronted young Billy Mac and warned him not to be like his father. Will MacIntyre took those words to heart, deciding that since his father had been a crook, he would be a hero. Will MacIntyre was relentless in his pursuit of that goal. He began training his body and mind when he was still just eight years old. He isolated himself from all distractions and all but ignored his peers. Becoming a hero like Hourman was what gave Will MacIntyre's life meaning. By age seventeen, he had acquired the physique of a body-builder. When he went to college, he studied martial arts, science, criminology, anything that would prepare him for life as a crimefighter. Gradually, his powers began to assert themselves. Contact with Dr. Cobalt's equipment resulted in Will McIntyre becoming linked to the electromagnetic spectrum. Taking the identity Triumph, he debuted almost simultaneously with Superman. A small grouping of heroes successfully repelled an invasion of pale martians and while the possability of a group being formed was discussed, nothing came of it. Meanwhile, Triumph had uncovered a disturbance in the earth's magnetic field. Aliens were sucking the planet dry of its magnetic energy and Triumph knew that this was a time for action. Convincing Superman to vouch for him, Triumph was able to gather the combined might of Barry Allen, Hal Jordan, Dinah Lance, Aquaman and the Martian Manhunter in their first formal grouping as the Justice League of America to repell the invasion. 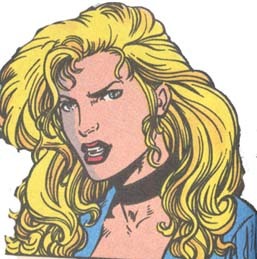 There was tension in the group, however, as Triumph's anti-social, task-oriented personality lead to conflict. As the battle hit its crucial moment, the heroes turned their attention towards a variety of tasks. The Martian Manhunter urged Triumph to be patient but Triumph felt the need to act. He punched the Martian Manhunter and proceeded to attack the alien ship. Damaging its space/time drive, Triumph and the ship were pulled into a sort of temporal limbo. The last few days of memory involving Triumph and the ship were forgotten by all who remained behind as the group drifted back to their seperate bases, unsure why they had come to Washington, DC. In Triumph's absence, the Justice League formed again to repel an Appellaxian invasion, no one the wiser that the team had already formed under Triumph weeks before to repel another alien invasion. When the Crisis in Time known as Zero Hour struck, Triumph and his alien adversaries were released from limbo. Triumph sought further aid from the Justice League of that era, who reluctantly provided it. Despite a series of misunderstandings, the team was successful. Triumph moved into one of the Martian Manhunter's homes as a houseguest of sorts until he got in touch with his broker and discovered that an investment in the Armchair Shopper Network ten years earlier had payed off, making Will McIntyre a millionnaire. Triumph has over a million dollars in disposable income, earned through an investment in the Armchair Shopping Network made ten years ago. Triumph's expenses are generally modest, save for the occasional expense in getting crime scene information processed or hiring specialists to help him out on difficult cases. His money combined with income made from various new investments should last him indefinitely. In terms of equipment, Triumph isn't up on the latest technology and prefers not to rely on gadgets. His costume is capable of shifting shape between civilian clothing and costume form, however. Beyond that, he doesn't have any special gadgetry or equipment at his disposal. Triumph has studied basic psychology and criminology. He is relatively familiar with the criminal psyche and with the typical motivations behind crime. Additionally, he is fairly well-versed in the physical sciences and capable of applying that knowledge to coordinate other heroes in the use of their powers to produce an attack of maximum effectiveness in many cases although his plans are generally a bit too rigid, allowing for almost no margin of error. In regards to his human resources, Will McIntyre has few contacts. His staunchest ally is Russell "Rusty" Wells, an old friend and his personal broker. Wells oversees most aspects of McIntyre's financial affairs. Beyond that, Triumph has few friends or contacts. His mother is dead and his father, diagnosed with cancer, escaped from prison and has not been heard from in two years. 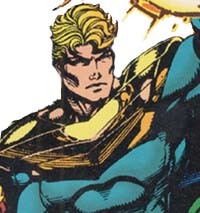 Triumph is known in the heroic community although disliked by many, primarily those who distrust the claim that he founded the Justice League. His strongest supporters are in the extended family of the Justice League, most of whom accept Triumph's claim. Even those on Triumph's side tend to be alienated by his attitude and generally avoid him if possible. Booster and Triumph have worked together on several Occasions, though it is only recently they are coming to a better understanding of one another. Public ID: Will McIntyre is a low profile figure, a man who made a small fortune in the stock market and yet, lives very simply. There is a ten year gap during which no one has seen him and those who are familiar with him are shocked by how well he's aged considering the fact that he is ostensibly 32 years old. Most people who know him know that he is Triumph, as he makes no effort to hide his identity although he also makes no effort to inform people of it. Costume ID: Triumph is a figure somewhat enshrouded in mystery. Two years ago, he appeared, claiming to be the founder of the Justice League. This claim combined with his authoritative attitude has made him unpopular with many in the heroic community. Most costumed heroes will recognize him although few know him well. The general public is only vaguely aware of his existence although he is a familiar figure in times of crisis.